Our favourite meal of the week. Here's the best roasts from around town. 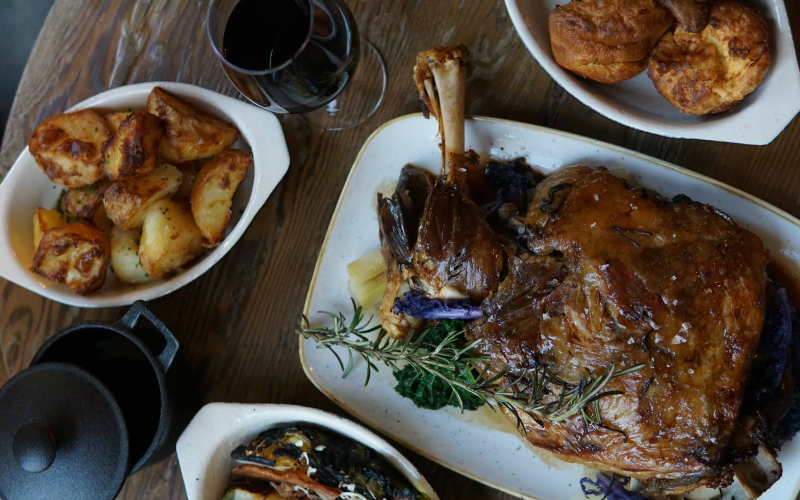 If we had to name our favourite thing to do in London, foodie or otherwise, it would probably be heading to the pub for one of the city’s many incredible Sunday Roasts. The combination of a cosy pub, the Sunday papers, stuffing yourself silly, and drinking a few pints is hard to beat. 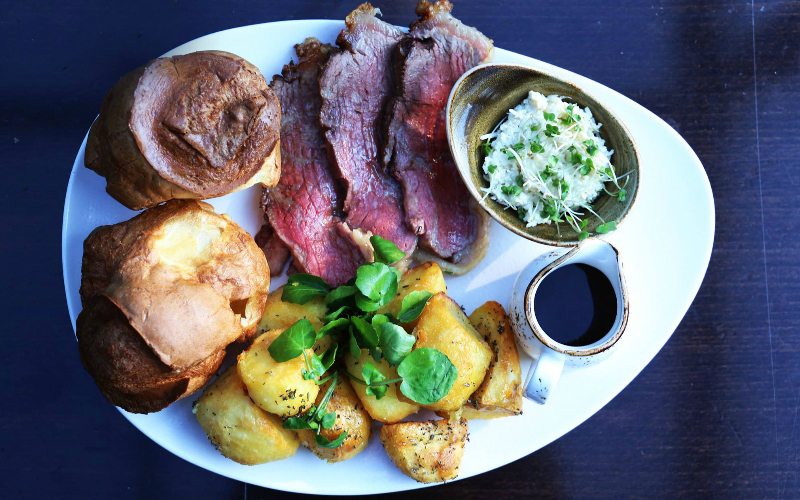 If you’re hungover, then then the best Sunday Roast in London is usually the closest one to your house. 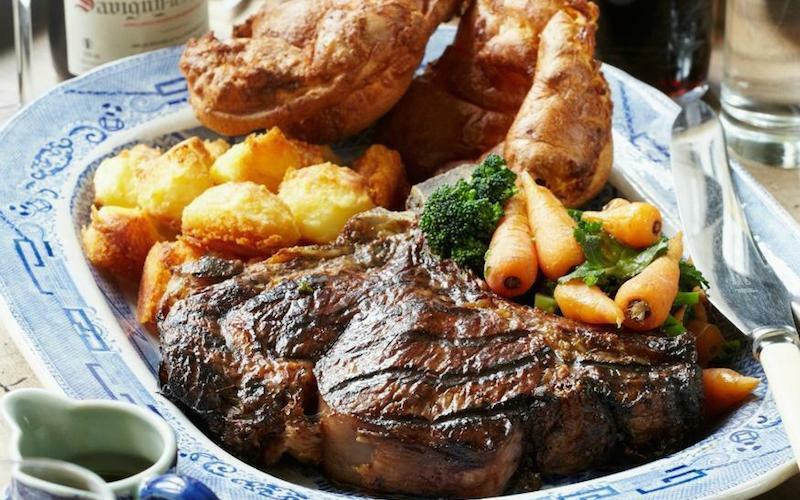 If you want to eat a truly spectacular Sunday Roast, however, then there are a few restaurants and pubs in London that set the bar very high. Everyone has their personal preferences but there are some things that every Sunday Roast should get right: crispy potatoes, perfectly cooked tender meat, and, Yorkshire puds most important of all, a thick, rich flavoursome gravy – and plenty of it. Nothing worse than a place that brings you a tiny thimble of gravy. From there, the veg, presentation, cuts of meat is all up for grabs. One of the best Sunday Roasts in London for us is at Blacklock, in Soho or Shoreditch, where the only sensible choice is to go “all in”. 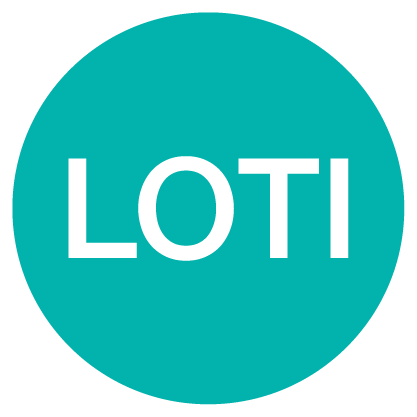 For £20 per person you’ll be presented with a huge platter of beef, lamb and pork, giant Yorkshire puddings, perfectly crispy roast potatoes, heritage carrots and sprouting broccoli. And at the bottom you’ll find three thick fingers of bread, soaked full of gravy and juices – a genius move. 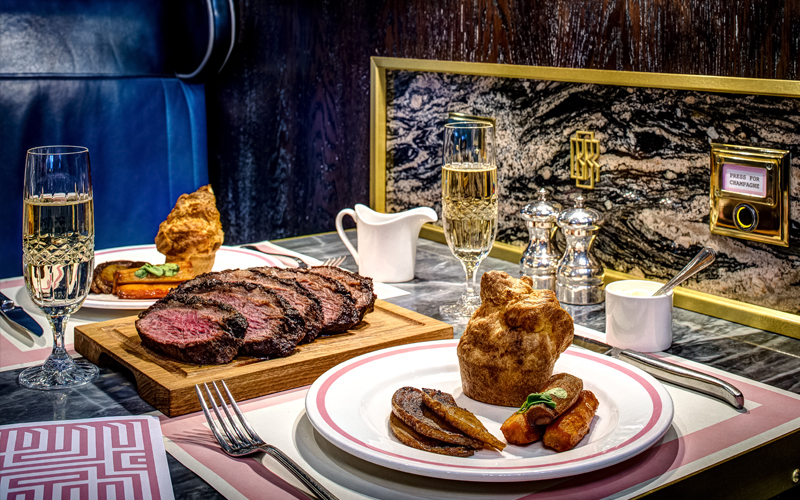 Many of the best Sunday Roasts in London take a more traditional approach. 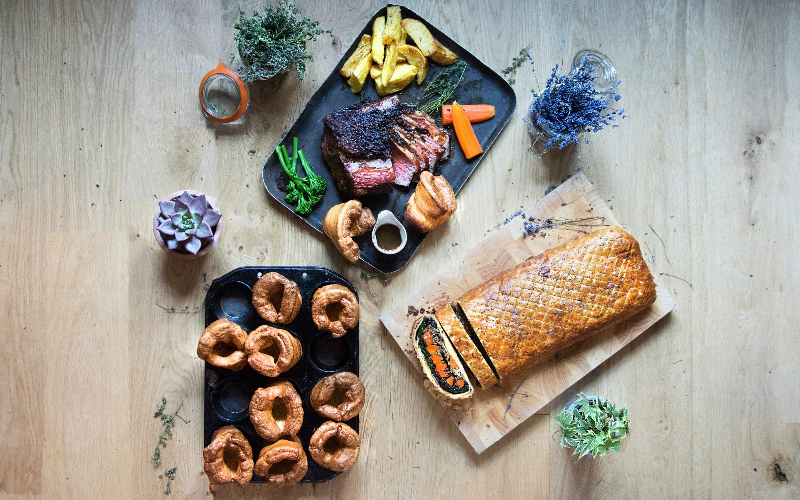 At Roast in London Bridge the choice include sirloin roast beef, pork belly,and roast chicken served with seasonal veg, crispy roasties, a ginormous Yorkshire pud. There’s also the option to order mash as extra (HOORAY for mash!). 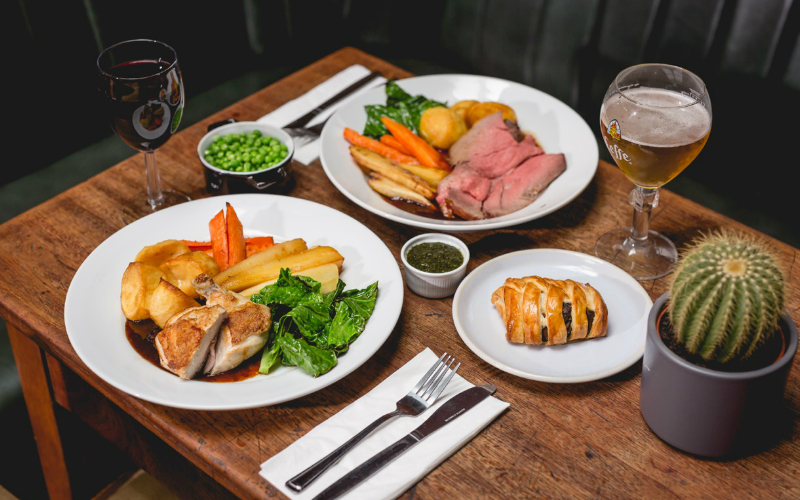 It’s all too easy to get stuck going to the same place every week but take a look at our guide below and hopefully you’ll discover something new to check it out amongst the many brilliant Sunday Roasts in London. We were already big fans of Cora Pearl, the second restaurant from the team behind Kitty Fishers in Mayfair. And then we went by for the Sunday Roast and we fell even more in love with the place. Any visit to Cora Pearl has to begin with the ham and cheese toastie aka the best toastie in London. This little beauty has ham hock and pig cheek wrapped up in a cheesy bechamel sauce and sandwiched in toasted white bread. The walnut pickle that comes across as a drunk, posh Branston is the clincher. Then there’s the roasts, thinly sliced medium rare beef or tender pork belly served with crispy potatoes, broccoli, Yorkshire puds, cauliflower cheese, carrots and lashings of an excellent gravy. They’re not the cheapest roasts in London but they are worth every penny. Simply one of the best out there. With Great British Menu chef James Cochran behind the menu, this is a pretty special roast. There’s just the one roast on the menu for the Sunday main event: Ayrshire 50 day aged Cote de Boeuf and slow braised short rib of beef, served with all the veg. Everything is seriously tasty; the truffle cauliflower cheese is now a breakfast snack we want for our elevenses every day of the working week. 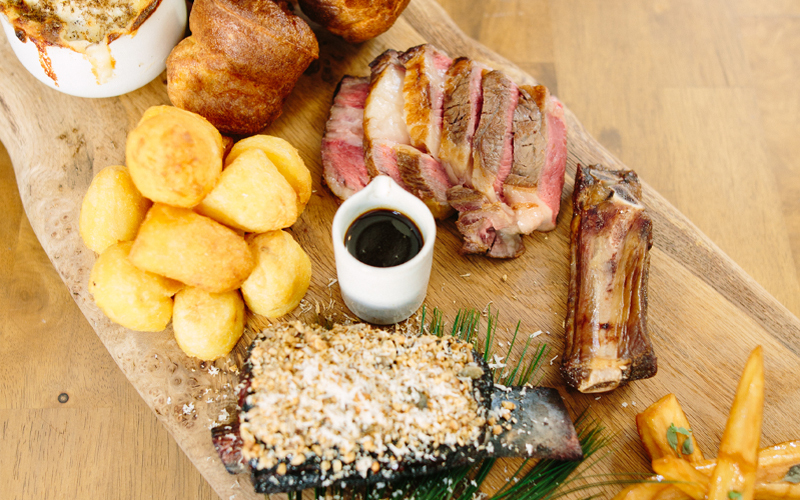 There is also Holwood Farm honey glazed parsnips, beef dripping roast potatoes, coal roasted cabbage, Yorkshire pudding, smoked bone marrow, gravy. BOOM. Even though the food for us is hands down amazing, it’s slightly on the spenny side at £25 although you do get a lot of bang for your buck. A slight readjustment could be considered given the desserts come in at £10 too, though again these are pretty faultless… mauled hobnob with dark chocolate, cocoa nib and banana – de-bloody-lish. 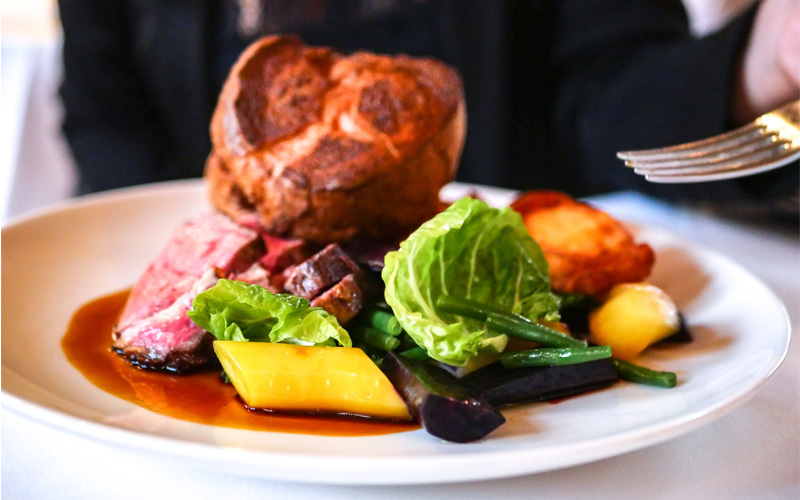 The Drapers Arms has one of the best Sunday Roasts in London and often gets booked up early so book a few days in advance if you want to be sure of a spot. Whether you choose the smart light-filled dining room or the sunny beer garden out back, it’s best to come here with a group and go for one of the big sharing roasts. The slow-cooked shoulder of lamb, roast forerib of beef, or whole roast chicken will all easily serve three people and come with perfect roasties, veg, Yorkshire puds and gravy. 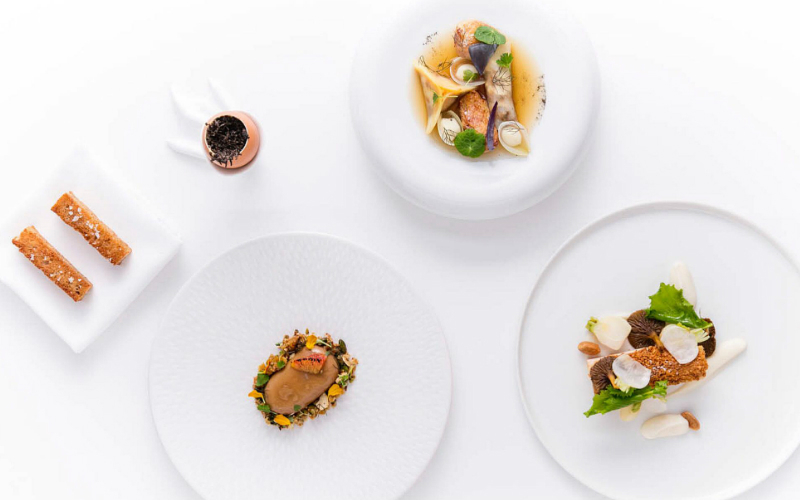 A three-course Sunday lunch inside a Grade II-listed building that sets you back just £38…that’s exactly what you get at Galvin La Chapelle. The restaurant holds a Michelin star, so you can expect things to be on the swanky side, except for the price that is. The delicate salt cod and lobster brandade, bisque and rouille is a must and the pavé of hake with grenobloise and crushed ratte potatoes is also worth a shout, not only for the crunchy lemon infused croutons but the mammoth portion of fish. The star of the show though is the Cumbrian sirloin of beef, served medium rare with roast potatoes, Yorkshire pudding and veg. It’s an old school roast more than it is a posh one so no need to worry that the portions won’t be on point. Make sure you get that Yorkie though – ours was forgotten and we were too engrossed in the food to notice until it was too late. Still, it’s a great roast and we’ll go back for that soon enough. The most important meal of the week has just had a massive upgrade at Hubbard & Bell, the all-day joint inside The Hoxton, Holborn. Not only are they serving up massive portions of slow-roast lamb shoulder, herb-fed spatchcock chicken or mushroom wellington – we can confirm that the lamb is epic, proper tender and juicy – with roast heritage carrots, honey-roasted parsnips, kale and gravy, they’re doing BOTTOMLESS roasties and Yorkshire puds. Yes you can keep the tatties and puds coming until you can’t eat anymore. And you don’t have to worry about your plate going dry as they are very liberal with the gravy serving. In case you don’t consume enough Yorkshires with your main, you can get one for dessert with the giant hot apple pudding pancake with bourbon caramel and cornflake ice cream. When we say giant, we mean it – this thing is bigger than your head and you definitely will need a lie down afterwards – but it’s totally worth it. 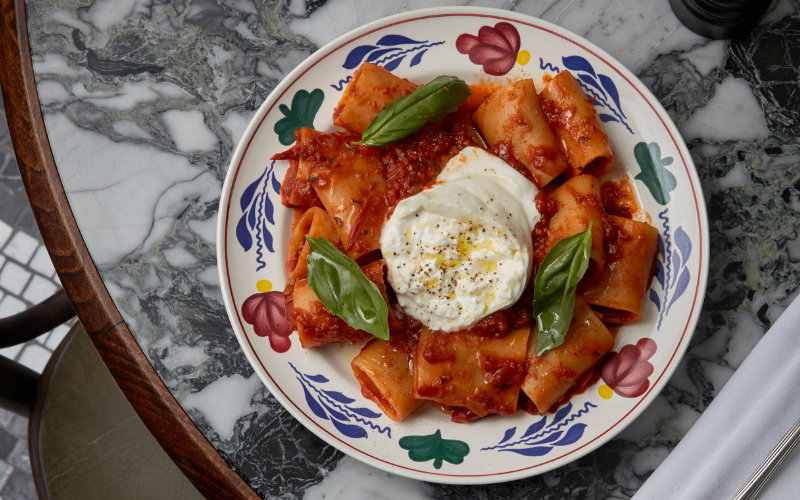 From 12pm – 5pm every Sunday the Cecconi’s Shoreditch kitchen transforms into an all-you-can-eat buffet for their Sunday Feast. Obviously there’s lots of Italian food on offer with cicchetti, loads of different types of pasta, pizza, salami and cheese to choose from. 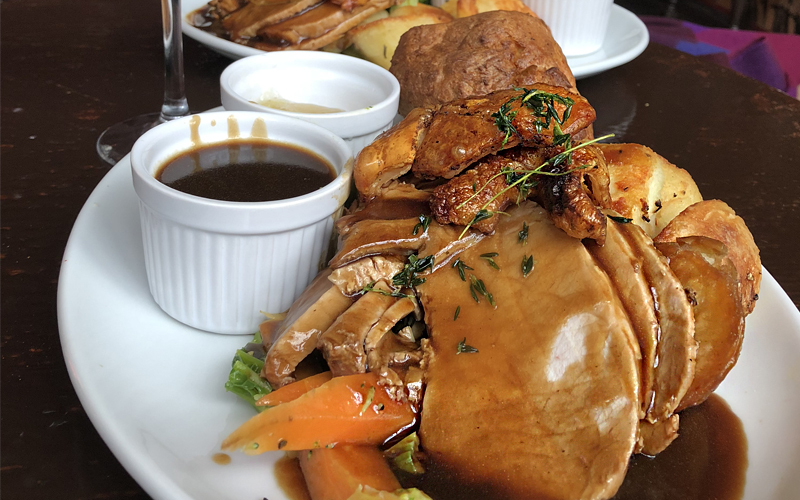 It also caters for those who can’t go without the traditional Sunday roast with a carvery station serving up the crispiest roasties, veg and a selection of roast meats. The dessert selection is also pretty impressive with tiramisu, profiteroles and plenty of cake on the counter. Better still, you can get yourself all this food for only £25pp, which is a bargain if you ask us! The Clifton recently reopened under new management with a new and improved look and menu. Located on a leafy street in St John’s Wood it’s hard to spot amongst the multi-million pound mansions but once inside you’ll feel right at home. The Sunday roasts come with all the trimmings and there’s always a selection of meats on offer – if you arrive early enough that is, as they do sell out fast. There’s a cracking range of wines as well as some bar snacks that shouldn’t be overlooked – hello haggis sausage roll – oh and you might spot a celeb or two there given its proximity to Abbey Road Studios. Take our advice and walk or cycle the canal pre- or post-dinner, then you will defo deserve dessert. We’re always on the hunt for a new Sunday roast and the newly-opened Madame Pigg has launched with a pretty perfect Sunday offering. Located on Kingsland Road where the short-lived second Stokey Bears used to be, it’s a cute neighbourhood spot that serves a mix of British and Italian dishes throughout the week and on Sundays switches to an all guns blazing roast line up. 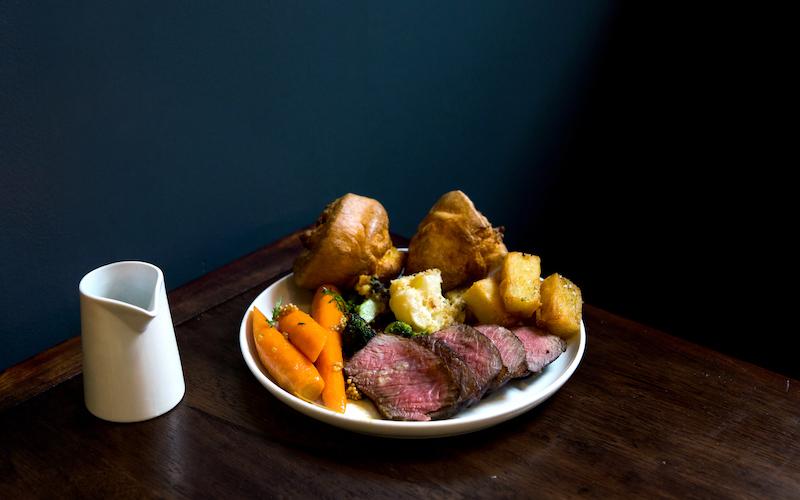 The roast beef is nigh-on perfection, and comes with Yorkshire puds, carrots, parsnip puree, duck fat roast potatoes and some buttered greens just for good measure. Get a side of the truffled cauliflower cheese and your Sunday will be sorted. 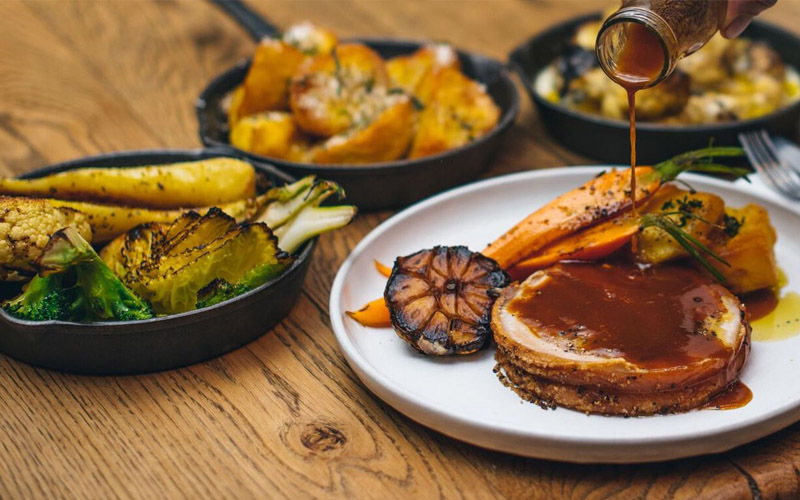 With a name like Roast it’s fair to say this restaurant sets pretty high expectations for its Sunday Roast, and fortunately it doesn’t disappoint. Looking over Borough Market, these guys serve up a slightly posher-than-the-pub version of a traditional British roast along with all the trimmings. The three course menu includes sirloin roast beef, belly pork and roast chicken served with seasonal veg, crispy roasties, a ginormous Yorkshire pud and the option to order mash as extra (HOORAY for mash!). The highlight of Roast has to be the desserts though, with twists on national faves including apple crumble and custard and sticky date pudding. 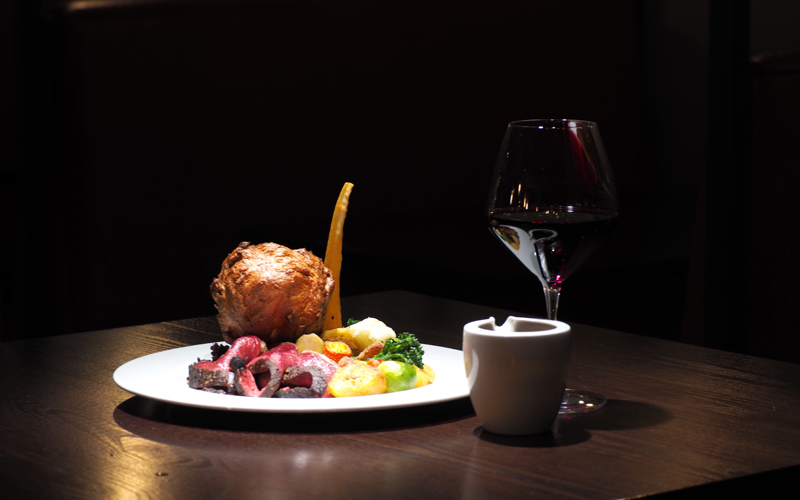 We definitely recommend having a roast at Roast – a great place to take the in-laws or the rents when in town. Bob Bob Ricard is a Soho institution, famous for its glamorous decor as well as THOSE press for champagne buttons on every booth. On Sundays, they offer one Sunday roast option, a traditional roast with all the trimmings which is fit for a king. The Irish Rump Cap Picanha is Hereford beef, cooked medium and served alongside slow roast potatoes and a giant Yorkshire pud. A plate of honey and thyme carrots and parsnips make up the veg with the finishing touch coming from a truffle gravy – yep you heard us, truffle gravy. The meat is cooked to perfection, the whole roast is impressive and there’s something truly special about BBR. It’s one of the most decadent places in Soho – here’s hoping they add a second button saying ‘Press for gravy’. 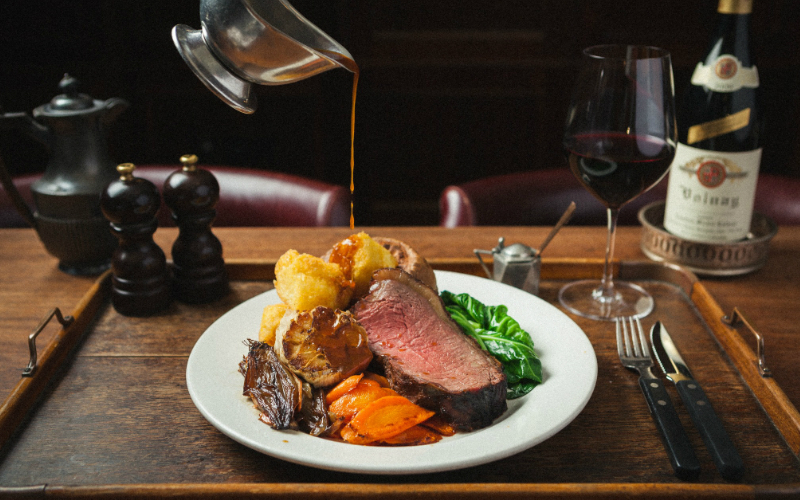 As you’d expect from somewhere that dishes up some of the best steaks in the city, Hawksmoor knows a thing or two about knocking up a bangin’ roast beef dinner… and yes it’s beef and only beef here on Sundays. Rumps of beef are started over charcoal before going in the oven to re-create that traditional spit-roasted flavour and you get a nice, fat slice along with duck fat roasties, carrots, greens, roasted shallots and garlic, a big ol’ Yorkshire pudding and plenty of bone marrow and onion gravy to drown it in, and you will want to drown it because that sauce is something else. What’s better than a roast at a straight up old school boozer? Nothing. Tucked away off Hackney Road, The Sebright Arms is a mighty pub on the rock ‘n’ roll circuit, it’s downstairs venue being on many a tour schedule. This winter however, the headliner is their Sunday roasts with Lucky Chip in charge of the kitchen. You’ve got 32 day aged Dexter Beef, pork belly, corn fed chicken and a nut roast to choose from, all coming with roasties, carrots, parsnips, seasonal greens and that all important Yorkshire pudding. The portion size is decent with plenty of proper gravy splashing about making Lucky Chip’s Sunday roast a strong one. A simple, old school approach done proper. 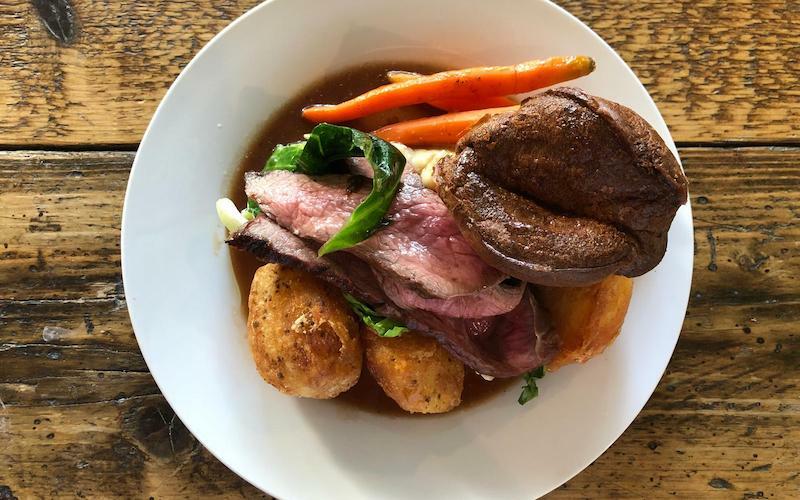 If you’re looking for a wholesome Sunday in North London then what better way to spend it than a walk around Woodberry Wetlands followed by a roast at The Naturalist. One of the latest additions to the Young’s pub group, The Naturalist is located just a two-minute walk from the water front and it has a posh but cosy feel to it. 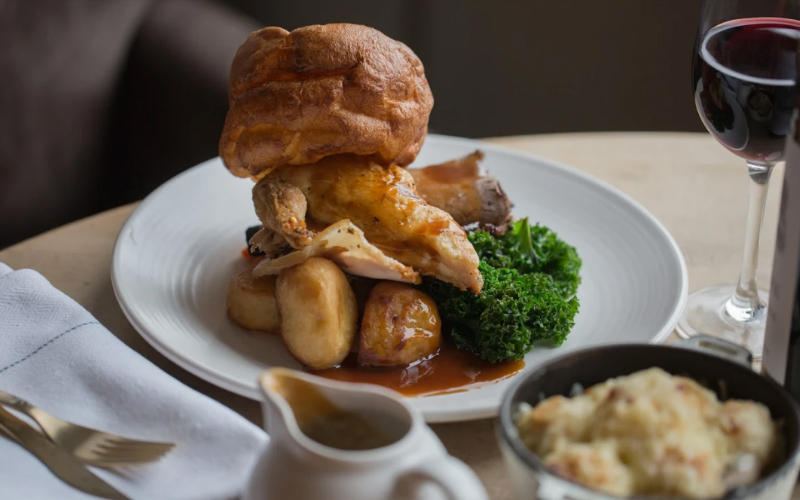 Their Sunday roast menu is simple and traditional, with roast Angus beef sirloin, lemon & thyme half chicken and wild mushroom & spinach wellington on offer. All roasts come with cauliflower purée, carrots roasted in locally sourced honey, roast potatoes, braised cabbage and a huge double egg Yorkshire pudding. If you manage to save room after your roast then make sure you try the peach and apple crumble, which comes with lashings of white chocolate custard – the ideal winter warmer. Part of the Andaz London Liverpool Street Hotel (although it has its own separate street entrance) Lady Abercorn’s Pub & Kitchen is a good little spot to have up your sleeve, especially as the City is often quiet on the weekends and Shoreditch can get pretty damn busy. The menu is short and features some more inventive starters and puds as well as the classic roasts. You do only have two meat options, though these change regularly, and a veggie wellington to choose from so just be prepared. What you do get though is perfectly cooked meat (we had nice thick slices of beef and it was bang on medium), roasties, seasonal greens, glazed carrots and BOTTOMLESS Yorkshire puddings. Yes Lady Abercorn did not come to play. They’re also very attentive with the gravy too so you don’t have to worry about all those extra Yorkies going dry. For us, the beef picanha from The Ginger Pig takes centre stage on Sundays at The Jones Family Project. It’s good, damn good. And if you’re anything like us the TALL (yes, very tall) Yorkshire pudding will also excite you no end. It all comes served with some mighty fine duck fat roast potatoes, honey roast parsnip and carrots, seasonal greens and lashings and lashings of gravy, with another gravy pot on the side, just for good measure. Yes we dig it. If beef doesn’t tickle your fancy, you’ve also got roast chicken, baked salmon and a nut roast to contend with too. The Jones Family Project also has good wine, good cocktails and a good-looking space to boot. Be-Bop-A-Lula is Stoke Newington’s latest pub on the scene, with a strong 50s rock ‘n’ roll theme and an even stronger Sunday roast. It’s one of the best value roasts around, with £14.50 getting you a big old portion of beef, pork, chicken, or lamb served with tasty roasties, Yorkshire pud and veg. We particularly like that the plate is covered in gravy and they give you another pot of gravy on the side as standard – you can never have too much gravy folks. They also have the footy on, so you can have the double winner of the Sunday games and a good feed to banish that hangover. 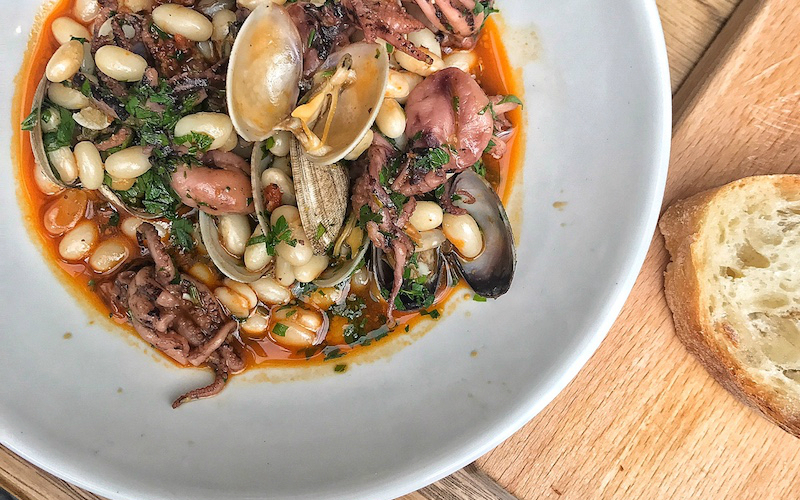 If you like to spend time your time dining in what is an urban sanctuary that ticks all interior goals boxes – think large oval striped oak tables, a huge marble bar and a palette of sandy and concrete tones – then Passo is the place. Sitting just off Old Street roundabout, the family-style Sunday roasts are a winner, the emphasis being on the ‘family’ in terms of portion size too. With their meat coming from HG Walter, you best be in the mood for a feast. Grass-fed Aberdeen Angus 35-day dry-aged porcini roasted rump beef, served medium rare as well as free range, corn fed, British garlic and thyme roast chicken were both excellent, soft and juicy. Served, just as they should be, with lashings of gravy, a Yorkshire pudding, truffle cauliflower cheese (hello), parmesan and thyme duck fat roast potatoes, honey roast root vegetables and chargrilled king cabbage with almonds, we felt a little spoilt. We did love, love, love this roast. Top marks.